Silver clay is a putty like substance made up of silver particles, a binder and some water. It can be rolled, textured and worked in a similar way to ceramic clays. Once it is dried it can be fired with a butane torch or in a kiln. The resulting piece is 999 fine silver and of hallmark quality. The two main manufacturers of silver clay are Aida (Art Clay) and Mitsubishi (PMC). I have used both clay types and tend to buy whichever is cheaper at the time! I don’t have a particular preference. Silver clay is available in different forms - lump clay, syringe, paste and paper. Sterling silver is also known as 925. This means that there are 925 particles of silver to 75 particles of copper. 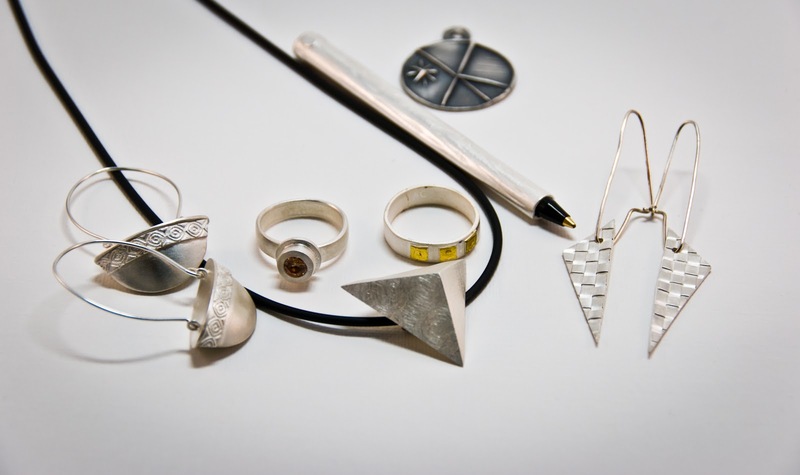 British metal clay artist Lisa Cain and colleagues at the Mid Cornwall School of Jewellery experimented with mixing PMC silver clay and copper clay to make sterling silver clay and did so successfully, having pieces tested at the assay office and hallmarked 925. They subsequently also successfully did this with art clay. Videos demonstrating how to make your own sterling silver clay can be found here for PMC and here for Art Clay. However, since this experimentation, sterling silver clay has been manufactured by PMC and is available to buy. Sterling silver is stronger that fine silver so is perfect for making rings or other pieces that need more strength. You can also roll it out a little thinner as it maintains it’s strength and is a little stronger in the greenware stage (when dry but before firing) although still take care when you’re filing! It carves and engraves well. However, it does have to be kiln fired, torch firing is not sufficient. And the kiln firing is in two parts, the second being in activated carbon. For those that are selling their metal clay pieces sterling silver clay is an attractive option as customers know what it is and are confident buying hallmarked sterling silver however the need for a kiln can put people off. Copper clay is available from a number of manufacturers, for a full list see here. Art Clay Copper (at the time of writing) is the most simple of the clays to fire as it can be torch or kiln fired. Copper clay is an affordable option although not everyone likes to wear copper jewellery. However, it could be a good option for making larger pieces like bracelets. I have enjoyed experimenting recently with bronze clay. I have been using Goldie Bronze. It is also very affordable and comes in many different colours. It arrives in powder form and is easy to make up into clay with ordinary tap water. This allows you to mix up the amount you need when you need it. I have been mixing Goldie Bronze hard and Goldie Bronze soft in equal parts to make my clay. Hard is great for making bangles and rings whereas soft is easier to carve and texture so a mix of both has, in my opinion, given me the best of both worlds. Firing Goldie Bronze does also have to be done in a two part schedule in the kiln in activated coconut carbon and, if you do it right, it works! In the UK you can purchase Goldie Bronze from Pajed. Other bronze clays are available and I am looking forward to having a play with Bronz clay which I believe carves very well. At the time of writing 3g of Art Clay gold is £259.95! Youch! It may not surprise you to know that I have not tried using it! However, there are other ways of adding gold to metal clay. I have had success with accent gold for silver which is 24 carat gold that you can paint onto fired on unfired silver clay. It is still costly, £82.95 for 1 gram, but a little does go a long way as you are only painting a layer onto the surface of the clay. You can also use keum boo, a gold foil that is adhered to fired silver clay. You can learn how to do this on our one day intermediate metal clay class. American metal clay artist Hadar Jacobson has her own range of metal clays featuring bronze and copper. She has created steel clay in quick fire and pearl grey. These clays also need to be kiln fired. See her website for more information (and some amazing inspiration pieces). The original fine silver clay is still the most reliable to fire. However, it is among the more expensive of the metal clays to work with so doing some experimenting with other metal clays could prove worthwhile, particularly if you have a design for a larger piece in mind. I really wanted to make a chunky bracelet in metal clay and am currently doing so in Goldie Bronze. The cost of the same amount of clay in silver would have been prohibitive. You do need to fire the majority of metal clays in a kiln (with the exception of art clay copper) but you may be able to find a kiln firing service in your area if you don’t have one. The final thing to note is that you do need separate tools for working with the different metals. Contamination from one type of clay to another can result in the piece not firing correctly and all your work is wasted. My main set of tools is for silver clay (as I started working in it I have more tools for silver!). I have a box of tools, texture sheets, clay roller etc that have just been used for bronze clay. Make sure you mark your tools clearly. In practice it hasn’t meant buying too many duplicate tools and I think the opportunity to try other metals has made the added investment worthwhile.